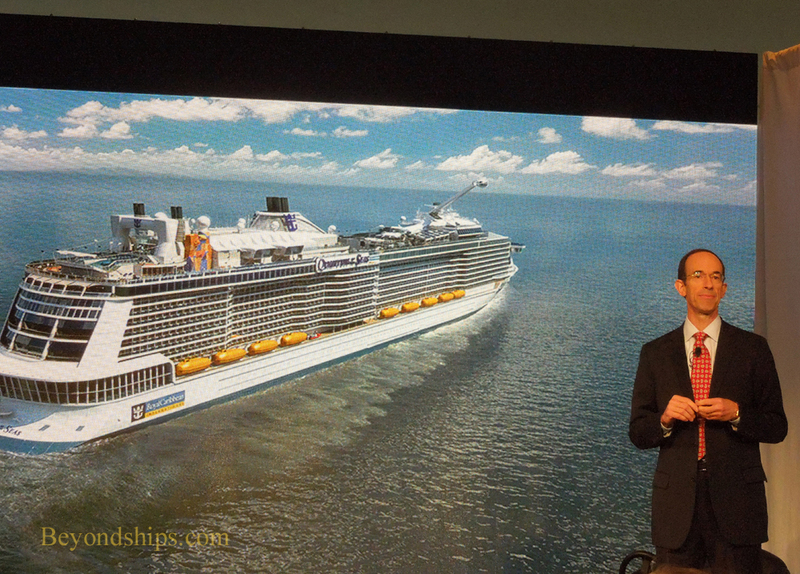 Quantum of the Seas will be 167,000 gross tons, 1,141 feet long and 131 feet wide. This will make her somewhat larger in volume, slightly longer and significantly narrower than Royal Caribbean's Freedom of the Seas. These dimensions will make Quantum the world's third largest cruise ship after fleetmates Oasis of the Seas and Allure of the Seas. However, the size of the ship is simply a by-product of the various features that Royal wanted to incorporate into the design, not an objective in itself. “I constantly argue that our objective is not to build the biggest in the world, our objective is to build the best.” Mr. Fain emphasized. 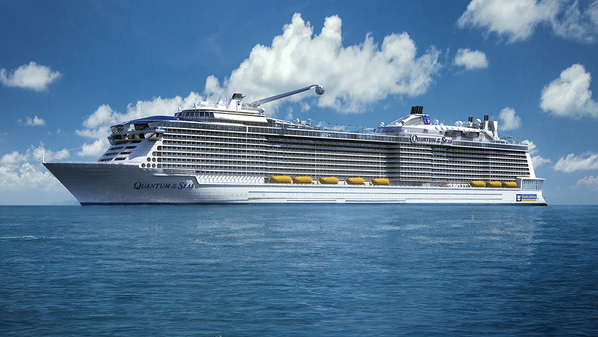 Above: A Royal Caribbean rendering of Quantum at sea. A goal that was widely-rumored before the unveiling was that the ship would be an all-weather cruise ship. Most cruise ships are still designed with the smooth waters of the Caribbean or the Mediterranean in mind. However, over the last decade, the cruise lines have been basing ships in more northerly ports where the weather can be more of an issue. Rumor had it that Quantum would be built to handle such conditions. Harri Kulovaara, Executive Vice President of Marine & Newbuilding, confirmed that Quantum was designed to be an “all-season” ship. “We have had that in our minds. The ship will be sailing out of New York, you want to have the all-season thinking in that.” (Quantum will be homeported in New York Harbor at the Cape Liberty Cruise Terminal in Bayonne, New Jersey). Executive Vice President Harri Kulovaara. An issue that has troubled many cruise ships based in northern climes stems from the fact that the upper decks are open to the weather. While this is great when the ship is in warm sunny waters, it means that a significant amount of the public space is unusable when the ship is in colder weather. As compared to other cruise ships, Quantum will have quite respectable although not outstanding speed. “She is designed for 22 knots but has the capability to reach 24. 22 is what we would call the itinerary speed. We have been looking at range and optimizing speeds. We have a tremendous focus on energy efficiency on all our ships.” Mr. Kulovaara explained. Quantum will have two azipods and three bowthrusters. This will give her the enhanced maneuverability that comes from an azipod propulsion system. “We [first] installed them in 1999 and we have not looked back. We have them on the Voyager class, the Radiance class, the Freedom class, Oasis and Allure and now Quantum. They have tremendous power and maneuverability - - something the captains appreciate very much. You want to be able to do your own power.” Captain Zini said. Some of the highlights of Quantum's public areas are discussed next.